Eileen Casey was born in the Midlands. Her debut poetry collection is Drinking the Colour Blue (Dublin, New Island Books, 2008). From Bone to Blossom (Dublin, Altents Publishing, 2011), a collaborative work with visual artist Emma Barone and featuring an introduction by Grace Wells, received support from Offaly County Council and South Dublin County Council. She devised and edited Flavours of Home and South of the County: New Myths and Tales, which showcases the work of writers from South County Dublin. 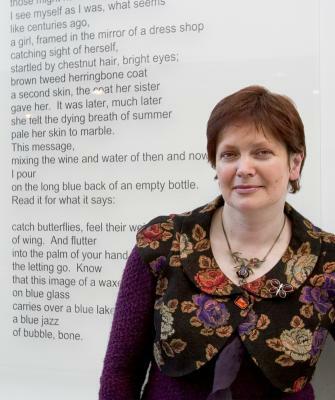 Twice shortlisted for a Sunday Tribune Hennessy Award, (Poetry 2004, Fiction 2005), she has shown three poetry-in-public places installations: Seagulls (2006, Tallaght Community Arts Centre); Reading fire, Writing flame (2007, Áras an Chontae, Tullamore); and The Jane Austen Sewing Kit (2007, Birr Vintage Week & Arts Festival). She has won many national and international awards, including The Oliver Goldsmith International Poetry Award, 2008, and the poetry category winner in The Green Book Festival, 2010, Los Angeles. Her awards for fiction include The Cecil Day Lewis Prize, The Maria Edgeworth Award, South Tipperary Literary Festival Award, Listowel Writers Week (short fiction) Awards, and a Hennessy Literary Award for Emerging Fiction in 2011. She was the visiting poet at Eastern Kentucky University Winter Programme in Lexington, 2011, assisted by Culture Ireland. She lives in Tallaght, South County Dublin, and is currently a creative writing tutor in adult education.